All masonry applications are an age-old form of art. For centuries, all masonry applications were applied to both new constructions and existing structures to enhance its design and functionality. If you need additional structures or just want to improve the ambience of your home, landscape or your business area, you can rely on Landscape Magic. We can do all the necessary masonry works with precision and quality craftsmanship. Landscape Magic is composed of expert masons who can effectively and efficiently use various masonry materials like bricks, cements, stones, and other materials to build new and magnificent structures. We build homes, walls, floorings, walkways, fireplaces, fences, and other vital structural pieces. Our masons have different expertise in order to precisely deliver our clients' requests. We have brick masons and block masons who are experts in building brick structures, fireplaces, walls, and other fixtures. They can accurately follow the details indicated in a blueprint. For example, they can level a place, lay mortar, and stack bricks accurately. Our brick masons know how to cut and shape a large brick or stone through the use of common and other specialized finishing tools. They can do this with minimal supervision but with quality results. 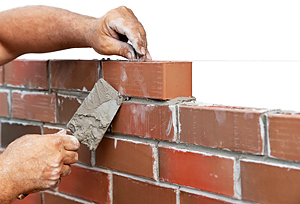 Landscape Magic also employs craftsmen who can handle any type of masonry work. Some of the masonry works we have already handled include laying foundations, beautifying walls with stucco or veneers, using pavers for walkways and driveways, and using other decorative pieces. Our professional masons are adept in creating attractive designs and applying exceptional finishing touches to structures. Landscape Magic is well regarded in the state of Arizona for our versatility in the craft of designing, installing, and maintaining landscapes. In addition to this, most clients also trust us for all masonry applications whether it is for their homes or commercial business establishments. Our quality work makes us the go-to company in Sedona and other major locations in Arizona. The professional masons of Landscape Magic are all equipped with the necessary training and are well-experienced in completing any type of masonry works. They are also equipped with the necessary tools to perform their job quickly and with high quality. Our company is also a certified concrete paver installer by Interlocking Concrete Paver Institute (ICPI). This association ensures that all its members possess the skills and know-how in the installation of interlocking concrete pavers. We are also an accredited and registered contractor in the state of Arizona. Whatever type of masonry work you need, Landscape Magic can do it for you. We deliver brickwork in building structures like homes and public buildings, veneer masonry in creating decorative and functional elements to structures, and concrete masonry and stone masonry in creating an enhanced character and style. Call Landscape Magic for all masonry applications in your property. Don't go for an inexperienced contractor who will only give you future problems because of unsatisfactory work. No need for back jobs or frequent repair and maintenance. Invest your money wisely by hiring registered, licensed and insured masonry contractor. Hire Landscape Magic to complete all the masonry works in your home, landscape or business establishment.